Torque Solution Stock Downpipe To Aftermarket 3” Catback Adapter is a must have when installing an aftermarket catback exhaust system. Designed to create a seem less install preventing the usual exhaust leak that occurs when not using our adapter. We chose to use CNC Stainless Steel instead of mild steel like the others. 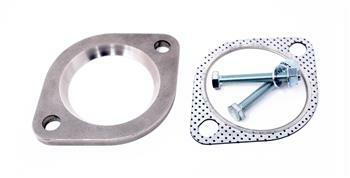 We include a high quality 3” exhaust gasket along with 10.9 grade zinc install hardware. With our choice of materials you can rest assure this part will last, which is why we back it by a Limited Lifetime Warranty. **Requires the stock donut gasket to be reused. **Gasket is not covered by our Limited Lifetime Warranty.